These titles were conceived separately, as individual free-standing books; however, almost from the outset (they were conceived sequentially also), it made sense to lump them together in one unit. 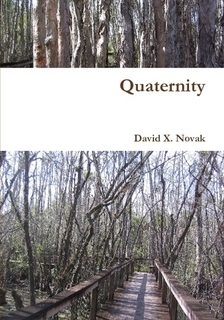 Hence the title: Quaternity. The obvious parallel is with Eliot's Four Quartets, and these were not far from my mind once I realized the superficial similarity. Thematically and structurally the books are nothing alike, however. Mine are not long poems, but collections of poems—seventy in each volume—with interrelated themes (as seen from what I have posted here) and a consistent verse form specific to each title, but not building upon one another as do the parts of "Little Gidding" or "East Coker."